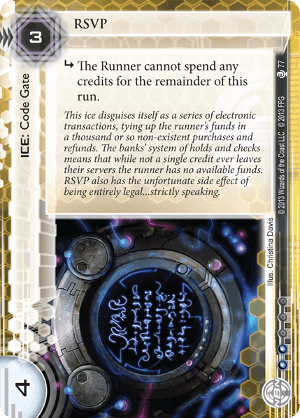 subroutine The Runner cannot spend any credits for the remainder of this run. This ice disguises itself as a series of electronic transactions, tying up the runner's funds in a thousand or so non-existent purchases and refunds. The banks' system of holds and checks means that while not a single credit ever leaves their servers the runner has no available funds. RSVP also has the unfortunate side effect of being entirely legal…strictly speaking. The cheap cost for Cyber-Cypher (and Atman at 4) unfortunately makes RSVP weak against the popular Prepaid Kate archetype which is one of the strongest runner decks at the moment. Many Criminal and Anarch decks splash ZU.13 Key Master however, which RSVP is incredibly taxing against. If Net-Ready Eyes leads to a resurgence of Yog in the meta then the stock of RSVP will go down significantly. An underrated piece of ICE that is great in certain builds but can feasibly be a one- or two-of in most NBN decks as well.